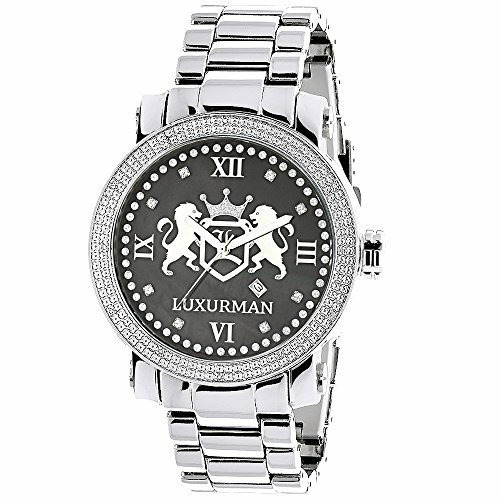 Designer Large Watches: This Luxurman Phantom Real Diamond Watch for Men features 0.12 carats of genuine diamonds, a stainless steel case with a stainless steel band, and a black mother of pearl face with distinctive Luxurman Logo. This LUXURMAN mens diamond watch showcases a fine Japan-made quartz movement and is water-resistant to 30m (99ft). Brand new watch, with full 5 year manufacturer's warranty, retail box and two extra leather bands in different colors. 0.12 carats of genuine diamonds. Oversized 49mm stainless steel case.